Forget carb-heavy pasta! This creative twist brings you fresh Italian flavor without any of the guilt. 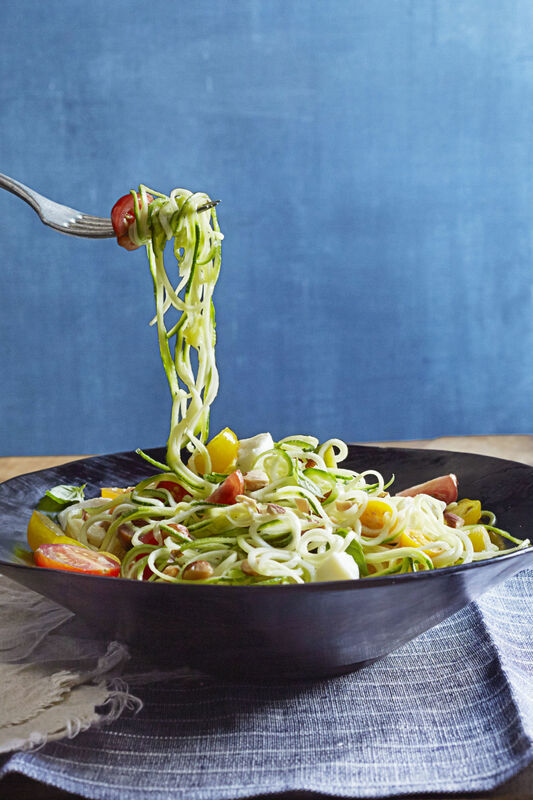 Enjoy oodles of noodles plus all your favorite pasta fixings —guilt-free! The secret? Subbing in spiralized veggies. This is from Good Hosekeeping. Heat oven to 400° F. Heat 2 tablespoons of the oil in a large ovenproof nonstick skillet over medium-high heat. Add the mushrooms and season with ¼ teaspoon each salt and pepper. Cook, tossing occasionally, until golden, 4 to 6 minutes. Add the shallots. Cook, tossing frequently, until the shallots are tender, 2 to 3 minutes. Transfer to a plate. Reserve the skillet. Whisk the eggs, crème fraîche, ½ teaspoon salt, and ¼ teaspoon pepper until combined. Whisk in the Cheddar and half the Parmesan. Toss the kale with 1 tablespoon of the remaining oil. Heat the remaining 1 tablespoon of oil in the reserved skillet over medium heat. Add the egg mixture to the skillet, followed by the mushrooms, the kale, and the remaining Parmesan. Cook until the frittata is set just around the edge, 2 to 3 minutes. Transfer the skillet to oven and bake until the frittata is just set, 20 to 24 minutes. Slide onto a plate to serve.